But the charge against Beck is demonstrably false. Beck has posted both images on his site to prove his point. The Beck comparison images show that the Bloomberg pose was clearly modeled directly after a famous pose by Lenin. Tobin, the Senior Online Editor for Commentary, seems to have based his remarks on erroneous reports about what Beck said and did. He would not, however, retract his charge after he was informed by Accuracy in Media that his account was flatly inaccurate. But this is not what Beck said and not what the NRA did. 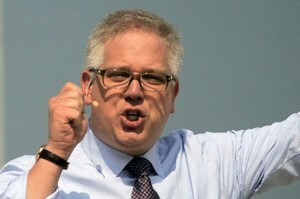 Not surprisingly, the George Soros-funded Media Matters attacked Beck for the alleged comparison in a story headlined, “Jewish Leaders Condemn Glenn Beck For Depicting Bloomberg In Nazi Salute.” The story was based on a falsehood that was accepted by these “Jewish leaders,” including Abraham Foxman, director of the Anti-Defamation League (ADL). Soros funds organizations critical of the Jewish state and sympathetic to the Iranian regime. Media Matters clearly hoped to resurrect the controversy over Beck, when he was with Fox News, having identified George Soros as having been a Nazi collaborator in his youth. Beck was fired from the channel after Soros and his operatives pressured Fox News CEO Roger Ailes and the channel’s advertisers to dump Beck. The Zev Chafets book, Roger Ailes Off Camera, confirms the role of Media Matters and the ADL, as well as Beck’s criticism of Soros, in his forced departure from Fox News. However, Beck started his own television channel, TheBlazeTV, available through Roku and some cable and satellite systems, and still hosts a daily radio show. People might legitimately object to Beck’s comparison of Bloomberg to Lenin, one of the intellectual godfathers of the totalitarian communist ideology that murdered a hundred million people last century, but his point, made in a humorous manner, was that both have a mentality of controlling peoples’ lives. Beck argues in his new book, Control, that government has violated individual freedom and gone too far in regulating personal behavior. A billionaire, Bloomberg is currently a major funder of legislative attempts to restrict the constitutional right to keep and bear arms. As mayor of New York City, he has tried to dictate the size of soft drinks people can buy. His latest proposal is to force stores to hide tobacco products from potential buyers. But the “upraised arm” was similar to the gesture of Lenin, and is clearly not the same thing as the Nazi salute given by Hitler. Beck is a staunch supporter of Israel who has exposed the Muslim Brotherhood and the global Jihad against the West. The reporter noted that it was Beck now demanding an apology: “I would like to call for an apology now by the mainstream media, particularly ABC News, for smearing my name and saying that I am making Bloomberg look like a Nazi,” he said. Cliff Kincaid is the Director of the AIM Center for Investigative Journalism and can be contacted at cliff.kincaid@aim.org. “But the charge against Beck is demonstrably false.” Just like your pathetic attempts to link Sen. Rand Paul to the Russian government or Marxists.